Rafael Cabrices does not know whether the attack will come by sea, by land, or even from within Venezuela. But he is sure that US President George W Bush is plotting to oust leftist President Hugo Chavez - and Mr Cabrices is preparing his people to fight. "That crazy man wants the petroleum," Mr Cabrices, 60, says in his office decorated with posters of Che Guevara, Simon Bolivar and President Chavez. 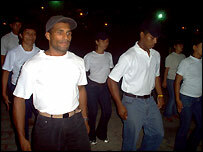 In the empty parking lot outside, civilian "corporals" bark commands at groups of adults and teenagers in white shirts and black caps and pants. They are marching around, training for battle. Over recent months, the populist president has warned that the US may invade Venezuela or try to assassinate him. He has called for Venezuelans to join a new civil reserve defence force, which, it is claimed, numbers two million members. During a recent commemoration of a revolutionary war battle, Mr Chavez called for preparation for an "asymmetric war" against the world's most powerful nation. President Chavez has called for preparation for an "asymmetric war"
The training of citizen-soldiers is part of an increasingly militaristic emphasis in the six-year-old 'Revolution for the Poor' headed by Mr Chavez, a former army paratrooper who led a failed military coup attempt in 1992. During recent months, Venezuela has been buying 100,000 AK-47 rifles and military helicopters from Russia, as well as ships and planes from Brazil and Spain. The arms-buying spree worries Colombian leaders, while US officials have asked why Venezuela bought more rifles than it has soldiers. Those officials have suggested that excess rifles might be smuggled to illegal armed groups in Colombia. "What in the world [is the threat] that Venezuela sees that makes them want to have all those weapons?" US Secretary of Defense Donald Rumsfeld told the Miami Herald recently. Mr Chavez's warnings that the US, which buys most of Venezuela's oil, might invade, have resonated with his supporters. They have been suspicious ever since Washington rushed to endorse the April 2002 coup which briefly unseated the president. Venezuelan officials assert that the arms and the citizen reserve are for purely defensive purposes and that Washington resents the fact that Venezuela did not buy US-made weapons. Mr Cabrices' 140-member-strong Popular Defence Unit trains weekends and weekday evenings in an empty parking lot in a middle-class Caracas neighbourhood called "The Paradise". The quiet street leading to the site is lined by homes, pre-schools and a hospital. On a warm evening, a group of about a dozen men and women in their 20s and 30s march stiffly to their corporal's commands of "Left, right, left". Nearby, teenage boys and girls seated on the ground listen to their commander explain how 'imperialism' undermined Bolivar's revolution. "The president is talking about" the threat of an invasion, "and the president doesn't talk foolishness," says Olimpia Hung, a cheery 44-year-old clothing merchant and impassioned Chavez supporter. "Fatherland or death." The reserve unit has no weapons, Mr Cabrices says, but he wants some. He interrupted an interview to ask a reporter if he know anyone who could bring them arms. "For defence one needs arms," he says. "It's logical." 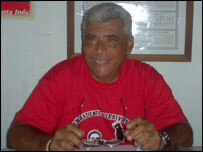 Paunchy, grey-haired and wearing a red shirt with the slogan "Combatant of the Revolution", Rafael Cabrices is a polarising figure here. During the April 2002 coup, he was among a group of Chavez supporters filmed firing guns from a downtown Caracas bridge. Many Chavez opponents accuse the bridge gunmen of shooting some of the 17 people killed and more than 100 wounded that day. But Cabrices says he fired only at anti-Chavez police and hit nobody. After the president's supporters swept him back to power, Mr Cabrices and others were jailed for a year and then cleared. 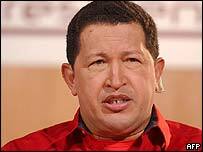 To Chavez opponents, he represents the violence and lawlessness they say the president's "revolution" promotes. "If Cabrices is a leader, then he can lead other prisoners in jail," says Mohamad Merhi, whose son Jesus was shot and killed while participating in an anti-Chavez demonstration during the coup. After leaving jail, Mr Cabrices established this government-sponsored "endogenous nucleus", an initiative to promote self-help among the poor. The nucleus has a small hydroponic vegetable garden, as well as Cuban doctors who provide basic medical care. Within two years, he says, the nucleus's members will build housing, stores and factories on the parking lot. But it is the group's military training which has attracted attention. Critics say Venezuela's new military reserves are intended more to intimidate domestic opponents than to repel foreign invaders. "We could come to a point where this militia could take over Venezuela," says Daniel, a neighbour and university student who would not give his last name. "You and I couldn't be here talking in the street." But retired General Alberto Muller, a military analyst who is close to Chavez government officials, says Venezuela's new reserve is similar to the US's own Army Reserve and civilian forces in many nations. "The ideal would be like Switzerland, where every citizen has his weapon in his home," Mr Muller says. Many observers dismiss the idea that the US would, or even could, invade Venezuela, a democratic nation and crucial oil supplier, particularly with the US military already overstretched in Iraq. 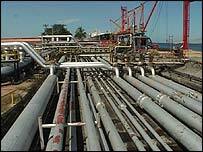 US officials have frequently criticised Mr Chavez's domestic and foreign policies, but dismiss suggestions that Washington is planning military action against the supplier of 14% of its petroleum imports. Colombian military analyst Alfredo Rangel, who heads the Security and Democracy Foundation in Bogota, says the reserve forces' real purpose is to repress internal dissent, and suggested that they will be given some of Venezuela's new Russian rifles. Rangel says nobody will invade Venezuela, but that if the civil reserves were to confront a trained military force "they wouldn't stand a chance," he says. Not everybody sees the civilian forces as so threatening. Ana Maria, a slim, soft-voiced 17-year-old member of Cabrices' unit, said the experience is teaching her discipline, values and self-defence skills. "I'm learning to defend my Fatherland and myself," she says. "It has nothing to do with weapons."